group A named list of principals. In general, the permission to create new objects is defined in the parent. 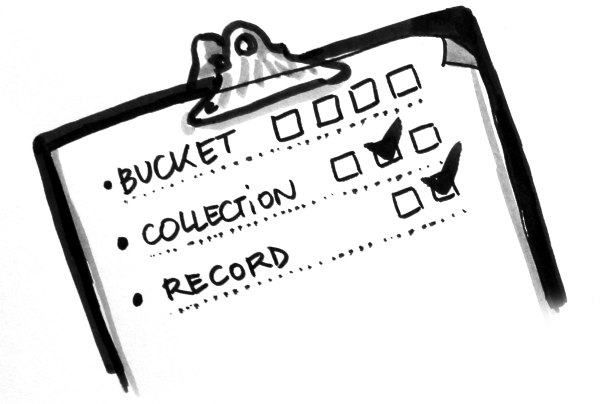 For example, the permission to create records is defined in the collection, and the permission to create collections or groups is defined in the bucket. The permission to create new buckets, however, is controlled from the server configuration. An entity that can be authenticated. Principals can be individual people, applications, services, or any group of such things (e.g. username, group:authors). A permission is an action that can be performed on an object. Examples of permissions are “read”, “write”, or “create”. The subject on which a permission is applied. Buckets, Collection, and Records are examples of objects. An ACE associates a permission to both objects and principals. This allows you to describe rules like “Members of group admins can create collections” (e.g collections:create = ['group:admins',]). A string that identifies a user. Check out our blog post on permissions in Kinto for more information.